Aluminum is one of the common materials which we use daily and holds faced-center-cubic structure at ambient environment. Theoretical calculation has predicted the possible phase transition of fcc to hcp, and hcp to bcc under high pressures at 120 GPa and over 380 GPa, respectively, but so far only the first transition has been observed experimentally. 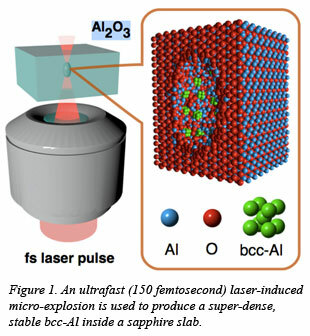 An international research team including Wenge Yang (HPSynC) and researchers from Stanford, Australia National University, Zhizuoka University and Swinburne University of Technology first synthesized the BCC Al phase with ultrafast laser induced confined micro-explosion inside a sapphire and confirmed the new phase with high energy synchrotron x-ray micro-diffraction technique. By focusing single short laser pulses of light onto a sapphire, the scientists were able to induce a micro explosion to create local high pressure and temperature conditions inside the materials (Fig. 1). This process mimics the kind of seismic forces that have shaped the earth and other planets, melting and reforming materials under intense pressure, allowing them to synthesize the superdense aluminum materials. The new stable high pressure bcc-Al phase is preserved inside the amorphous compressed sapphire produced from a hot, dense, non-equilibrium and short-lived plasma. The sapphire constituents aluminum and oxygen become spatially separated in the hot expanding plasma due to the differences in the ion diffusion velocity, and the new bcc-Al phase is “frozen” within the compressed sapphire. This was confirmed later with synchrotron micro-diffraction. This research has been published in Nature [A. Vailionis et al., Nat. Comm. 2, 445 (2011)].